This is a 1936 photo of Washington Avenue, just south of Claremont Parkway. The neighborhood was poor, and a true melting pot of immigrant eastern-European Jews, Italians and Germans. The horse-drawn wagon seen here was the type well known to most south Bronx residents up through the early sixties, when the wagons and their wares disappeared forever. The corner of Fordham Road and Valentine, looking southeast. This picture was taken in 1944. You can see the sea of belgian cobblestones that were used to pave streets, and Howard's Clothing store for men, where I got my Bar Mitzvah suit in 1959. I still have the wooden hanger that says "Howard's" on it. This is a picture of Williamsbridge Road taken from the corner of Pierce Avenue, looking down towards Sacket Avenue and the bridge over the Amtrak tracks. Judging by the cars in the photo, it must have been taken in the mid 50's. This was my Dad at bat in "45 Field," located between Bathgate Avenue and Lorillard Place. I'm not sure of the year but it must be in the early 40's or late 30's. 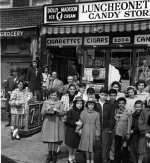 This was Susie's Candy Store taken early in the 1950's (I'm thinking 1953), located on East 183rd Street and Hughes Avenue. 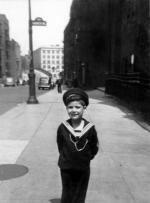 This photo was taken of me in 1944. I'm standing in front of P.S. 88,at Marcy Place and Sheridan Avenue. The view is looking north on Sheridan. The building immediately north of P.S. 88 is 1348 Sheridan Avenue. Looking further north you can see 170th Street and then Taft High School. Notice how clean the street is, and also the late 1930s vintage of the few cars in the background - this of course because they didn't make cars during WWII. Taken in the early 1940s, this was Zerega Avenue, looking toward Castle Hill Avenue from the corner of Fuller Street. Editor's Note: Across Castle Hill Avenue is St. Raymond's Church. This majestic building is The Daughters of Jacob Home and Hospital on East 167th Street between Findlay and Teller Avenues. This picture was taken in the 1930s. There is no other building like it in New York City, and it stands today as it did one hundred years ago, a place of refuge and care for the aged, and a Bronx neighborhood icon. This was Ogden Avenue at 171st Street, looking north towards where Ogden ended at University Avenue. It was taken in 1962. Here's another of Ogden Avenue at 171st Street, with a better view of the stores across the street, also taken in 1962.